After launching its Mi 9 flagship smartphone in China a week prior, Xiaomi has announced it will be coming to worldwide markets at its press conference at MWC 2019 in Barcelona. The Mi 9 device, succeeding the Mi 8, has some pretty impressive features, including its powerful cameras, but it remains to be seen if the Mi 9 will help Xiaomi achieve its goal of finally breaking into Western markets. Perhaps the most appealing aspect of the Mi 9 is its tri-lens rear setup, which consists of a 48MP main camera, 16MP ultra-wide and 12MP telephoto lens. These are joined by a 20MP selfie-cam, which seems surprisingly powerful for a front-facing snapper. One novelty of the device is its curved back, as opposed to most handsets which have flat rears, which provides a unique feel as well as better protection for the phone 173g, 7,61mm phone. The device’s 3,300mAh battery is nothing particularly special compared to the rest of the market, but its 20W wireless charging seems rather useful (and speedy), particularly given that most devices have 15W wireless charging as standard currently. The phone is powered by the Qualcomm Snapdragon 855 chipset, the latest processor that also powers some versions of the Samsung Galaxy S10 series. The Mi 9 also features Game Turbo mode, which when activated boosts performance and framerate while playing mobile games. 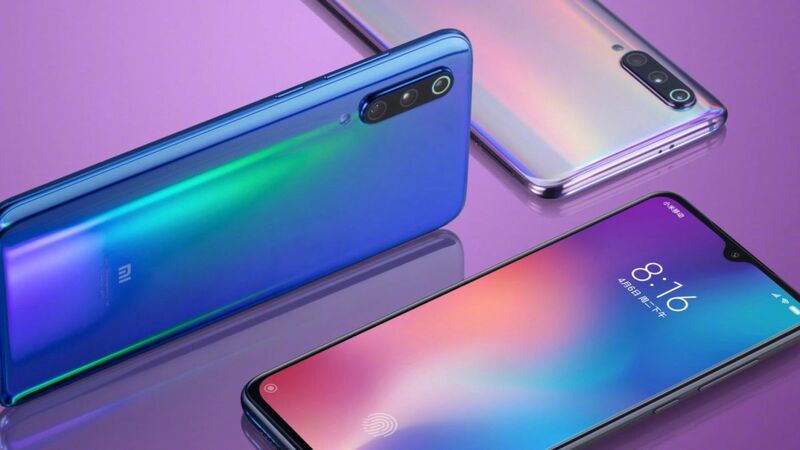 The Mi 9 will launch in three colors – ‘Ocean Blue’, ‘Lavender Violet’ (which looks red to us) and ‘Piano Black’. The curved rear of the device causes a rainbox effect, according to Xiaomi, giving it a funky look. We don’t currently know the release date or price of the device but will update this page when we do.